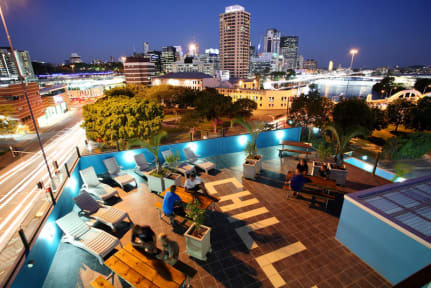 Located in the City Centre just 250mts from the Roma Street bus & train station, Chill offers air conditioned rooms, free off street parking, fast cheap Wi-Fi and great common areas to relax, all with fabulous sweeping views of Brisbane the River City. 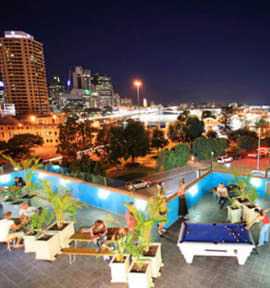 'This hostel delivers city & river views like no other Brisbane hostel. There is a movie room too, but why not kick back with a cocktail on one of the fabulous decks'. Chill Backpackers is BYO so you can save money & enjoy your own beer or wine from the bottle shop! We are close to everything Brisbane has to offer; Southbank Parklands, Queen Street Mall, Casino, Suncorp Stadium, XXXX Brewery, markets, cinemas, night-life, supermarket and more. Just ask our staff for a map, you can walk to everything! Never be bored! Free ping pong, board games, movies, PlayStation, sun-loungers and we have a pool table with a hell of a view! Our high speed Wi-Fi is $2.50 for 24hrs unlimited or use the free hr daily in our lounge. Driving a car? We have a lot of free off street parking! However, if you have a vehicle please call us before arrival just to let us know you require a parking spot. Arriving after midnight? No problem please call our reception. Looking for work? We offer a free job club to help you find a job & we're good at it! You'll be safe with us. We are in a safe part of the city centre in a well-lit street and have state of the art security and fire detection systems operating 24hrs. Our friendly reception team are here from 7am-midnight 7 days a week, if you require a late check-in then we have an out of office phone number at the property. Chill was the perfect mix of social but chilled. Deck closed at midnight so no concern of noise after that. Met some great people. Absolutely perfect location for travellers, about 5 minutes walk to the Greyhound coach terminal and not too far from the airport either. The staff are absolutely top notch, very welcoming, chatty and know their stuff about the city. Room got upgraded both times we stayed. Excellent location, so close to Roma Street Station and art galleries, relaxed 30 minute walk to Paddington. Staff were friendly and special mention to one lovely girl who remembered us from our first stay and even remembered that it would have been the birthday one of the girls in our group and wished her happy birthday. Just remember to put down your bond for plates etc before you go all the way up to the kitchen. The hostel has a nice rooftop area on 2 floors which was great to hang out. Different activities every evening hosted by the friendly staff. Really close to the bus station. Was a nice hostel in a great location. The showers were good and warm, with straighteners and hairdryers in there to use. Matt at reception was super helpful with information about the city and also job advice. The only downside was that we had to pay for WiFi. Wasn't enough room in fridge, need a lighter to start the stove but there isn't any there half the time. There are no lockers in the rooms. Our key cards stopped working repeatedly, but the staff were very helpful and friendly. Good location and the deck was great. Very noisy at night. Doors slamming and noises carried. Great location and easy airport access to southbank area. Staff is great and location is good! Kitchen got messy at night but was cleaned up by the morning. The outdoor space is great!